Eric Plewinski received his Bachelor of Music degree from the University of South Florida. During his Tampa, FL residency, he performed in various theater productions and as an orchestral percussionist with The Florida Orchestra and the Southwest Florida Symphony. Eric was also a member of the national touring ensembles backing operatic tenor Michael Amante and Grammy award-winning Broadway singer Bernadette Peters and can be heard as a member of the McCormick Percussion Group on Music For Keyboard Percussions,The Music of Gui Sook Lee, and Concerti for Strings With Percussion Orchestra all of which are distributed through NAXOS. 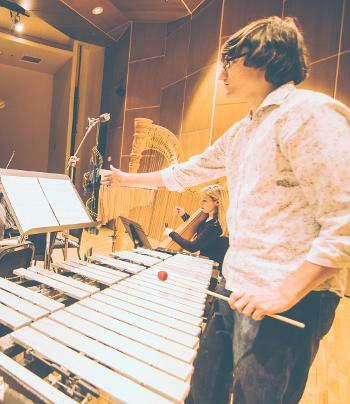 Eric completed his Master of Music degree at the University of Maryland, College Park where he studied with the principal percussionist of the National Symphony Orchestra, Eric Shin. Additionally, he has studied with Jauvon Gilliam and Tony Ames. Previously, Eric has performed with such groups as the Baltimore Symphony Orchestra, National Symphony Orchestra, Richmond Symphony Orchestra, Annapolis Symphony Orchestra,Fort Worth Symphony Orchestra, Orlando Philharmonic, Virginia Symphony, Maryland Symphony, Virginia Opera, Washington Chorus,Congressional Chorus, New Orchestra of Washington, Great Noise Ensemble and regularly with GRAMMY-nominated, Inscape Chamber Orchestra. Eric has participated in multiple summer festivals including the National Orchestral Institute and four summers at the AIMS festival in Graz, Austria. Eric is currently on faculty at Washington College, Robinson Secondary School and West Springfield High School. Eric is available for private instruction and is a versatile performer with a thorough background in classical, contemporary, rock/pop and Broadway/musical theater.